The performance took place as a Networked Scenario between Berlin and Beirut. 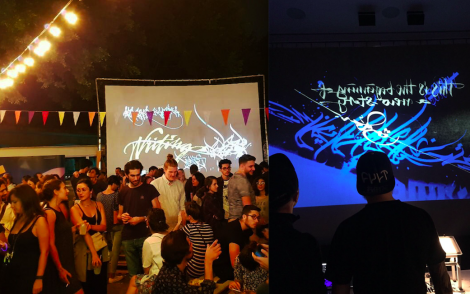 The calligraffiti & media artists in both cities started a trans-local dialogue, sending calligraffiti messages back and forth using the Infl3ctor for a live performance to celebrate the opening of the new Goethe Institute of Beirut. 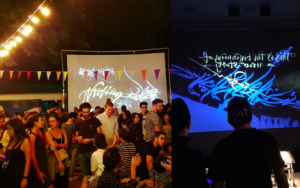 The media window of Collegium Hungaricum in Berlin and a facade at Goethe Institut Beirut were transformed into a digital canvas for travelling iconic tags. More over, a series of Digital Calligraffiti activities followed up, where masters of the calligraffiti community including the initiator Niels Shoe Meulman used the Infl3ctor table.